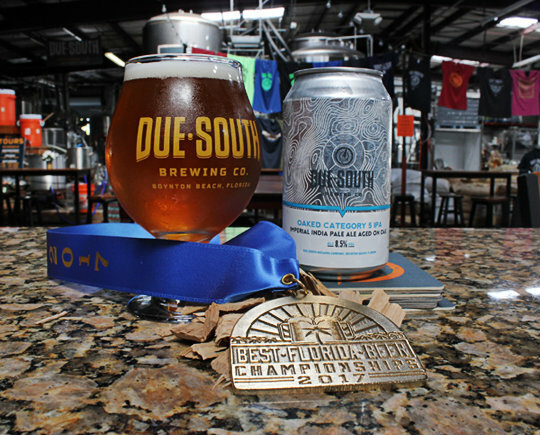 Oaked Category 5 IPA Wins Gold At Best Florida Beer – Due South Brewing Co.
Oaked Category 5 IPA won Gold in the Wood and Barrel-Aged Strong Beer category at the Best Florida Beer Championships on March 5, 2017. This special beer is an iteration of our award-winning Category 5 Imperial IPA aged on a unique blend of oak to create an incredible woodsy character. Oaked Category 5 IPA will be available in the taproom and through a limited canning run in the coming weeks. Congratulations to everyone at the brewery for this win!